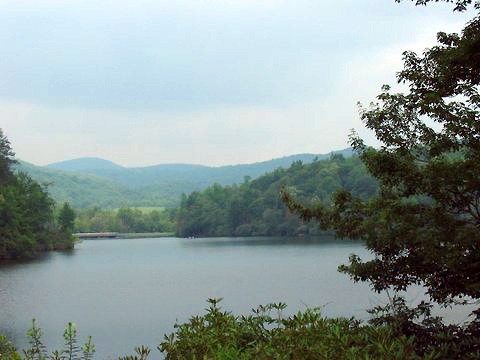 North Carolina's Blue Ridge Mountains have been a favorite travel destination for my family since my youth. The cool mountain air beckons us there during summers in which a major train trip is not part of the equation. 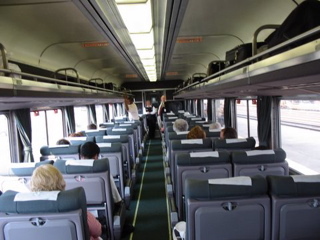 Of course, like any diehard railfans, we find a way to mix in some trains with our automobile travels. Our first stop, Macon, Georgia provides a chance to reconnect with family friends who date all the way back to my college days. After a cookout at their lovely home we take in a minor league baseball game between the Macon Music and Bradenton Juice. This is independent level minor league ball and we surmise that a strong college team like Florida State or Georgia Tech would give these teams fits. The ball park is an old facility and sports a sign noting that Georgia Tech played its first varsity baseball game here in the early 1900s. The night is spent at the brand new Hilton Garden Inn located at the edge of the Mercer University campus and we are very pleased by the ambience and freshness of everything in the hotel. The next morning we poke around downtown Macon for awhile and note the maze of rail lines that converge in the central business district. 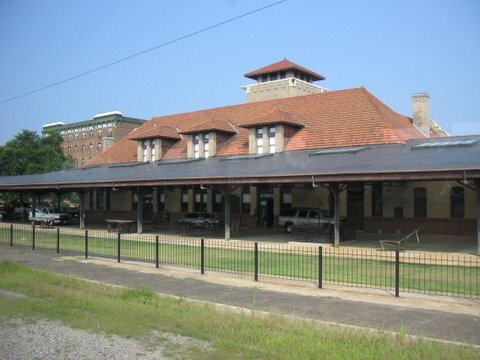 The old railway station survives today for non-rail use but harkens back to a day when Central of Georgia and Southern Railway passenger trains called on Macon on their journeys across the Peach State. 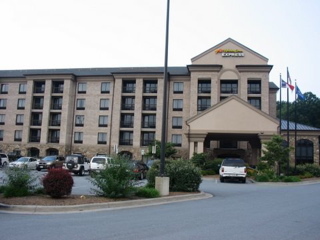 Our next stop is in Greenville, South Carolina where we spend the night at the Hyatt Hotel located in the center of the city. A pleasant walk down the main street takes us to dinner at a favorite southern restaurant chain, Sticky Fingers, which serves up some of the best ribs found anywhere. The downtown is bustling on this Saturday night and the area seems prosperous as restaurants and popular stores welcome patrons. After dinner we make our way to West End Field, home of the Greenville Drive baseball team www.greenvilledrive.com a member of the Class A South Atlantic League. The league logo features the abbreviation "SAL" which to this railfan means "Seaboard Air Line". West End Field is just over a year old and sports the exact dimensions of Fenway Park, home of the Drive's parent team, the Boston Red Sox. There even is a miniature green monster in left field which stands in front of a row of luxury condominiums. On this night the Drive beat the Charleston River Dogs, a Yankees affiliate. The stadium is located on the western fringe of downtown, convenient to our hotel. Following the game we navigate our way to the Amtrak station to pick up tickets for a train ride we have scheduled for the following week. The station is located adjacent to a rail yard and is hard to find as an Amtrak sign seems to point down a street that leads to an undesirable area and another sign outside the station grounds gives the impression that this is a no trespassing area that would invite the ire of railroad police. 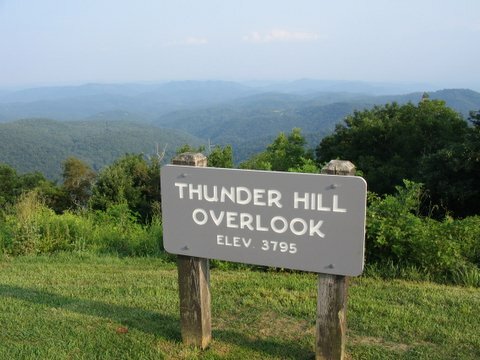 The following morning we make our way uphill to Asheville, North Carolina then enter the Blue Ridge Parkway for the spectacular drive to Boone, NC. It is a chilly late July day and the fog is thick which obscures much of the view. There is no apparent activity down below as we pause at the overlook over The Loops where one can often hear and catch glimpses of CSX coal trains working their way through the serpentine route along former Clinchfield tracks. About an hour later we are in Boone for a few days of relaxation. We spend our time doing what we always do in the mountains: taking scenic drives, walking along rippling streams, having a picnic along Price Lake, visiting Mast General Store, enjoying good home cooking at Dan'l Boone Inn, people watching at Blowing Rock Park, and riding Tweetsie Railroad. Our home for these few days is the Holiday Inn Express in Boone www.expressboone.com which offers a large room that is quiet and that provides a view of the surrounding mountains. The staff at this hotel are extremely friendly which is a great way to start and end the day. 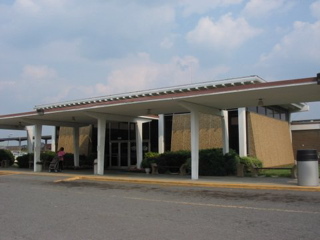 The lobby has a ski lodge feel to it that is appropriate for the area since several winter ski resorts are in close proximity. For breakfast we consume the delicious hot cinnamon buns trademarked by Holiday Inn Express. 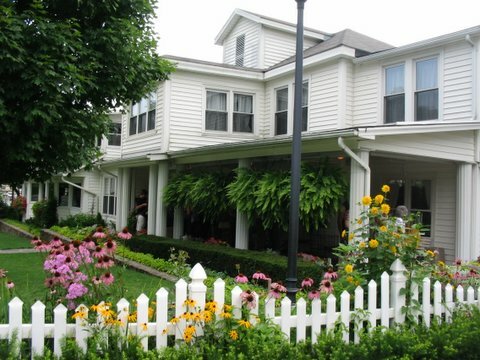 Dan'l Boone Inn in Boone, NC is a favorite place to eat. All you can eat family style meals are served by students from Appalachian State University. 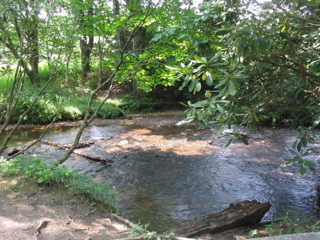 The Boone Fork stream is a favorite setting for picnics and hiking. Price Lake along the Blue Ridge Parkway. 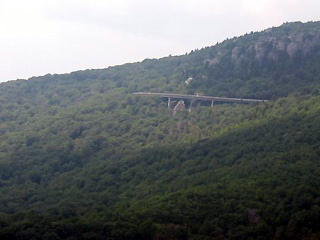 Linn Cove Viaduct is a modern engineering marvel as it hangs over the side of Grandfather Mountain on the Blue Ridge Parkway. 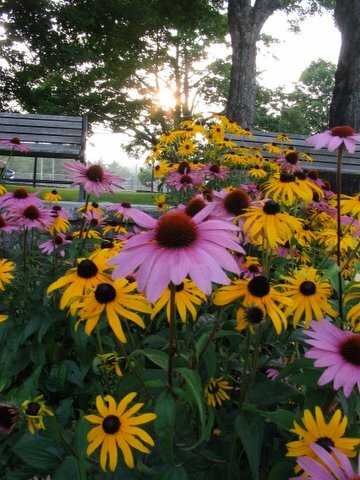 Sunset at Blowing Rock Park. 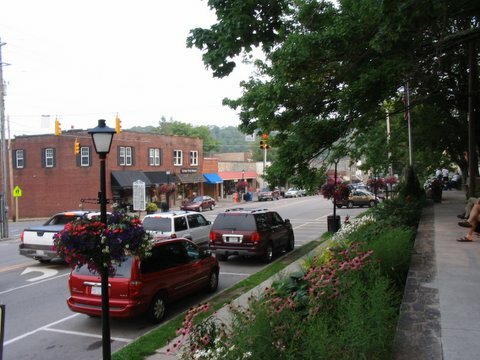 Blowing Rock, NC is the author's idea of Mayberry. 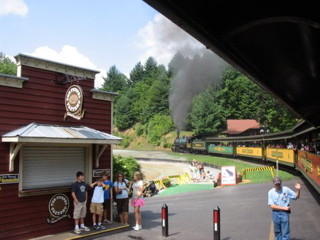 Our visit to Tweetsie Railroad reminds me of the days when I was in elementary school as my family owned a summer home in nearby Blowing Rock. 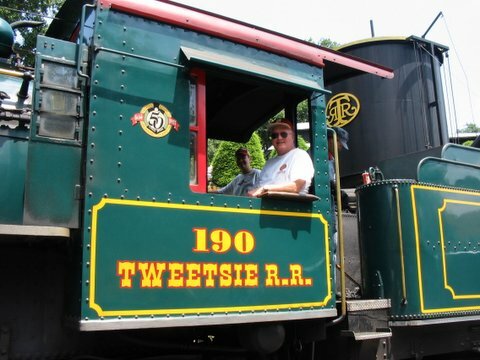 A visit to Tweetsie was an annual ritual and was the highlight of every visit to the mountains. Our ride around the 3 1/2 mile loop around Tweetsie Mountain is behind 2-8-2 steam locomotive # 190. She is nicknamed Yukon Queen as she served on Alaska's White Pass & Yukon Railroad before being brought to Tweetsie. 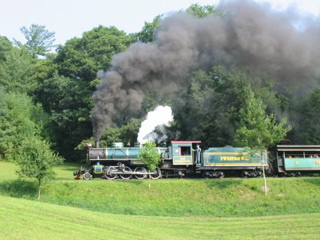 Sister engine # 12, an original East Tennessee & Western North Carolina 4-6-0 operates mostly during off peak seasons when passenger loads allow a lighter train. The ET&WNC was nicknamed Tweetsie and served as inspiration for this old style theme park's name. 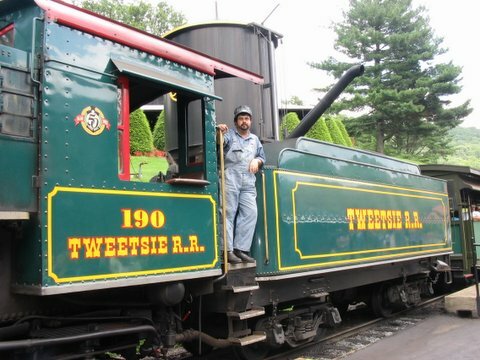 Tweetsie 2-8-2 # 190 leads its train past the engine shops and 4-6-0 # 12. 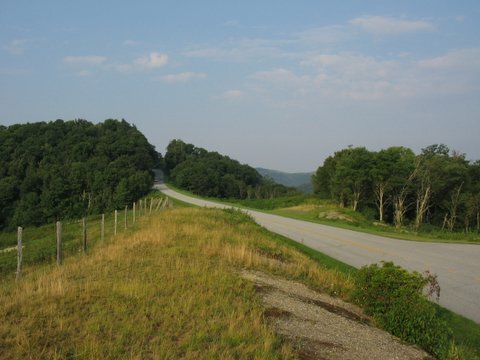 Passing through the rocky cut that marks the summit of a 5% grade. After grabbing a barbecue sandwich and watching a show at one of Tweetsie's pavillions, we take a second ride on one of Tweetsie's open air coach cars then my son John and I are invited to ride aboard the 190 as she makes another circuit of the narrow gauge line. Aside from the thrill of riding in an authentic working steam locomotive, the cab offers a great view of the right-of-way as the train crosses 225 foot Dead Horse trestle, tackles a 5% grade through a rocky cut, and passes through rhododendron rich woods. 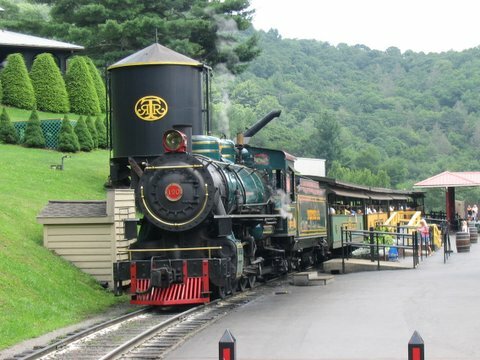 As we stroll through the parking lot after our third ride of the day, the mournful cry of the whistle reminds us that Tweetsie almost didn't live to see the summer of 2007 due to land lease issues. Thankfully, the park survived the challenge for the moment and hopefully will be able to continue delighting visitors for years to come. 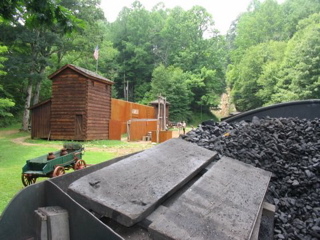 Check www.tweetsie.com for the park's operating hours. The author and son John aboard # 190. 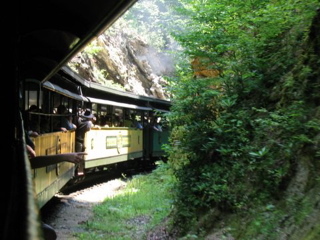 Inside # 190 as it rounds Tweetsie Mountain. A fireman's view of Fort Boone. 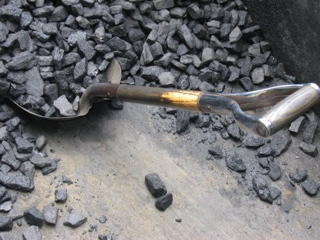 Firing a steam engine is hard work. The engineer relaxes between runs. 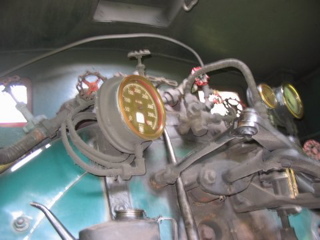 # 190 stands ready for the next run. 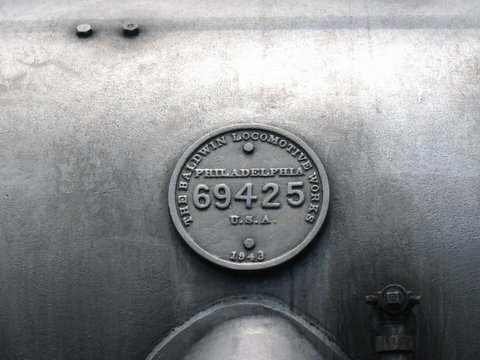 The builders plate on # 190. 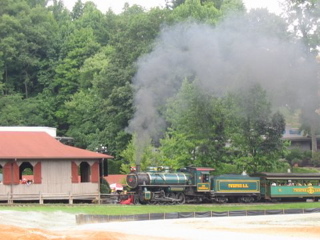 Another run heads out for adventure on the Tweetsie Railroad. 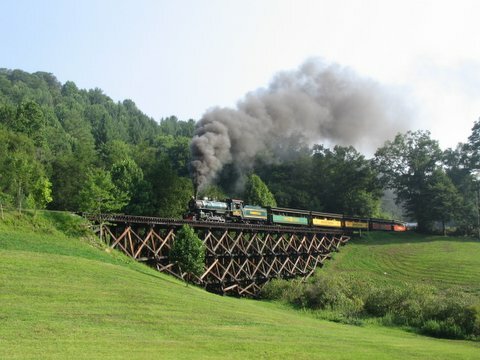 Crossing Dead Horse Trestle on an early August 2007 day. Heading upgrade toward the rocky cut. 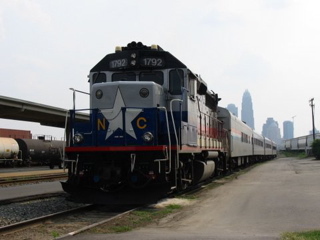 Following our week in the mountains, we make our way southeast to Charlotte to catch Amtrak train # 74 the Piedmont. The Charlotte station is open 24 hours a day and is conveniently located on the city's east side opposite Norfolk Southern's freight yard. Ample parking allows us to leave our van overnight without worry. A sizeable crowd of about 80 people awaits departure and the train eventually runs full for much of the journey. 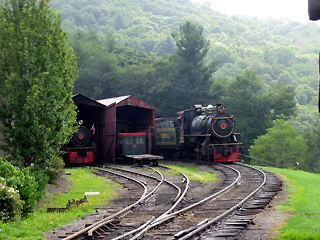 After the train moves from its stub end storage track to the platform track, passengers are invited to board at 5:05pm. 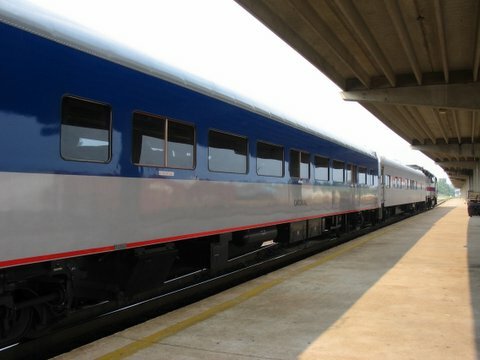 The four car consist is made up of former heritage fleet coaches with wide windows and new, well-padded seats plus a former Amtrak pub-lounge car; all of these are now owned by the State of North Carolina. Leading the charge is North Carolina DOT Geep 1792 decked out in the state's color scheme. 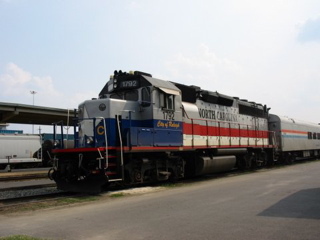 North Carolina DOT Geep 1792 in charge of the Piedmont at Charlotte on August 3, 2007.. 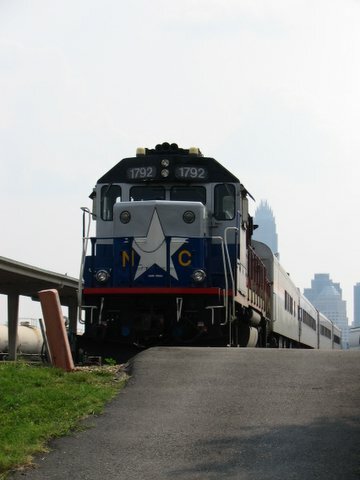 The Piedmont appears to teeter on the brink of a hill at the end of its storage track in Charlotte. Coach "Cardinal" is one of three coaches on the August 3, 2007 Piedmont. The interior of the Piedmont's coaches contain new seating and large windows. The Piedmont eases out of the station at 5:30pm and passengers are invited to the lounge car for a complimentary snack. They are admonished to take only one snack item and one soft drink per person and most seem to adhere to the rules. 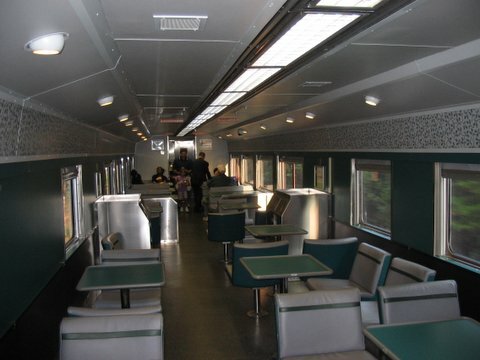 The pub-lounge cars such as this one started life as US Army hospital cars and eventually were converted to lounge cars for Amtrak's Florida trains and the Montrealer. On the latter the cars were called Le Pub while the Florida service warranted a piano intended to liven up the atmosphere. 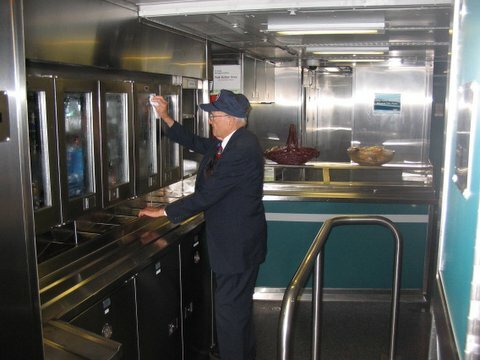 In Piedmont service car 400202 Albemarle Sound retains the walk through snack line and the table and fixed chair arrangement of its Amtrak years. There is no attendant today and the one drawback of this train is the lack of arrangements to purchase additional food during the northbound dinner time trip and southbound breakfast run. An interior shot of the pub-lounge car used on the Piedmont. Dispatching on the busy Norfolk Southern Washington to New Orleans main line is smooth and we meet two southbound freights on the same siding at Haydock. 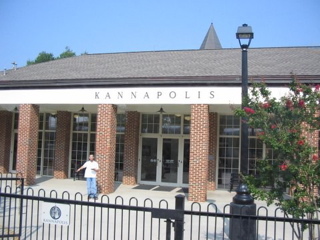 Approximately 15 passengers board at Kannapolis and word has it that the Friday afternoon train is typically filled as it is today. Another dozen riders climb aboard at the large Salisbury station and moments later we roll past the old Spencer Shops and the North Carolina Transportation Museum (see http://trainweb.org/vrt/AutoTrain/ for information about this railfan friendly facility). A northbound NS garbage train is overtaken as we approach our stop in High Point; it then passes us only to again be overtaken east of that city. Heavy rain and hail are pelting the train and the passenger seated beside me states that he is glad he isn't driving through this mess. His work schedule has been tailored around the Piedmont schedule so that he can take the morning train from his home in Burlington to Kannapolis, walk to work, then catch the evening train home. Multi-ride tickets are available for such passengers who commute to work or college. The Piedmont does a fair share of college business as it serves the cities where many universities are located including Duke University, North Carolina State, North Carolina Central, Elon, UNC Greensboro, High Point, and UNC Charlotte. 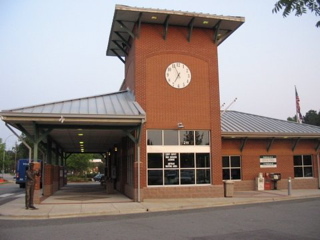 Our stop in Greensboro provides a look at an interesting intermodal station serving local busses and Amtrak. The line to Raleigh which we will follow braches off from the mainline to Washington here and there are separate platforms for the Crescent and the Piedmont/Carolinian routes. A large number of passengers detrain at the next stop, Burlington, as the weather clears to reveal a pleasant summer evening. A few minutes later we pass Amtrak's southbound Carolinian from New York which is running 105 minutes late. Several deer are spotted as we pass through woodlands west of Durham and soon the top of the Duke University Chapel briefly comes into view. The Duke East Campus appears on the left side as we prepare for the Durham station stop. To the south we can see Durham Bulls Athletic Park, the spiffy home of the AAA Durham Bulls baseball team. There is a game in progress tonight which reminds of our visit the prior summer when we attended a Bulls game. The final 20 minutes of our trip pass quickly and we detrain at the modern brick station in Cary. The courtesy van from our hotel awaits and moments later we are relaxing in our suite at the Homewood Suites in Cary. 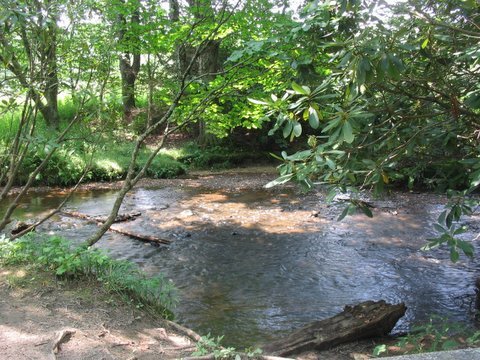 The hotel is located in a charming section of this Raleigh suburb. The hotel grounds are reached by crossing a covered bridge and passing through thick woods that look more like New England than a capital city suburb. The 6:00am wakeup call comes much too quickly the following morning but is necessary as we have a train to catch. The hotel's complimentary breakfast is perfect for a "grab and go" situation and we are grateful the hotel's houseman is ready to shuttle us to the depot. The Cary station is an interesting facility that was constructed a few years ago. 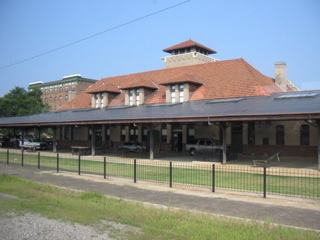 It stands between the former Seaboard line to Florida and the ex-Southern Railway branch to Greensboro which diverges just north of the station. The neat brick station has a small waiting room which is open from 4am to 1am and which has an unstaffed ticket office. Interestingly, the station building also houses a North Carolina Department of Motor Vehicles office where drivers licenses and license tags can be secured. 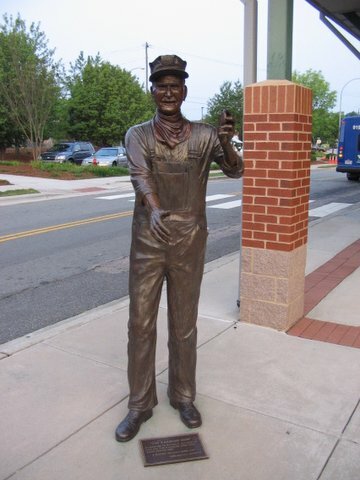 A statue outside the Cary station honors railway engineers. Directional signs point passengers to platforms serving two separate routes at Cary. 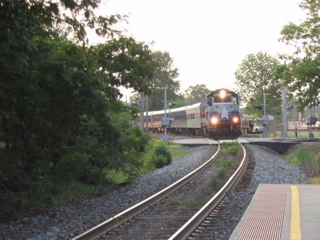 The southbound Piedmont arrives in Cary early on August 4, 2007. We expected this to be a light travel day but approximately 50 passengers are primed to board on this Saturday morning. A few others started their trips at the Piedmont's origin in Raleigh. 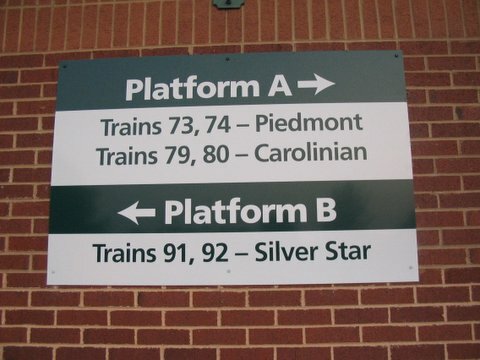 A loud speaker on the station grounds advises that the northbound Silver Star is expected at 8:15am; it will miss its connection as our Piedmont will be long gone at 7:30. Our departure is held up a couple of moments by the large crowd and the loading of one passenger's bicycle into the rear coach. 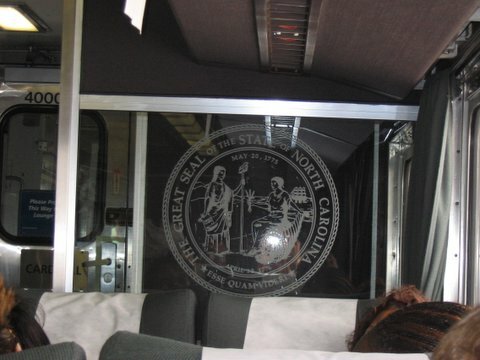 Etched glass panels are an attractive feature in NC DOT coaches. 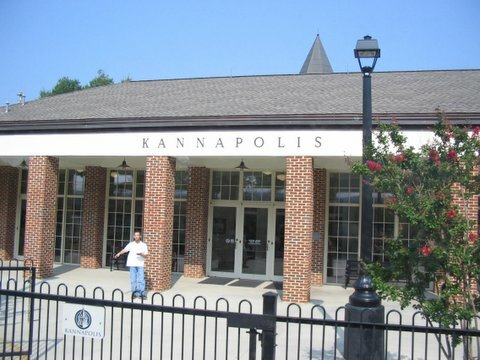 The return journey proceeds smoothly until we reach Kannapolis then slow running pushes us behind schedule. A 40 minute delay ensues and we wonder where the northbound Carolinian is since it started its run in Charlotte which is only 20 minutes ahead. Finally Amtrak # 80 eases past and we soon learn that it had struck a trespasser who had wandered onto the tracks. The resulting cleanup and investigation delayed the Carolinian 3 1/2 hours; fortunately we had lost far less as we arrived in Charlotte at 11:40am, a bit over one hour late. Despite the delay we were able to easily drive to the north side of Atlanta for the night before completing the trip home the following day. This had been a nice summer getaway with some train activity thrown in for good measure.